Going to be quite the windy day for the Midwest this New Years. The low pressure that brought the snow overnight will deepen even more during the afternoon. 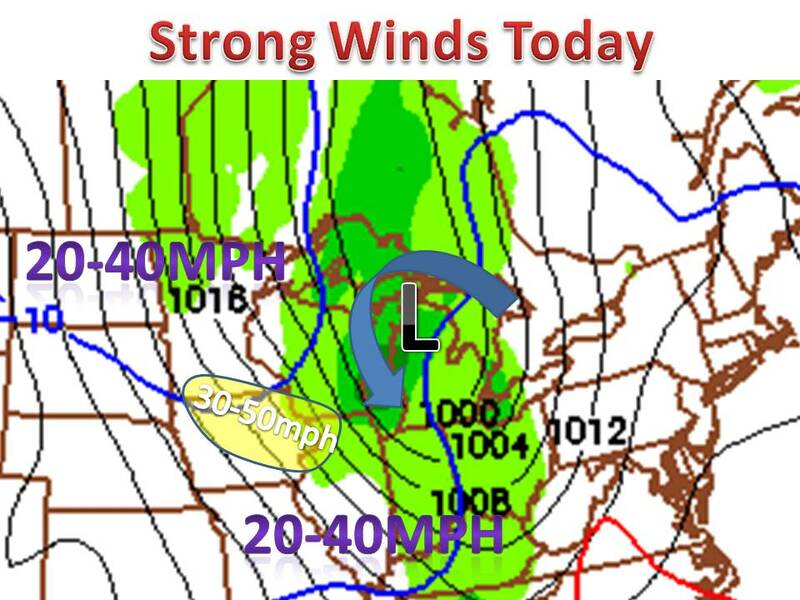 The tight pressure gradient will allow winds to howl all day long. Typically look for sustained winds of 20-40mph with gusts to 50mph. Parts of Iowa will see winds approach 65mph, sustained to 35-50mph. (Sustained is average wind gust over a minute and wind gusts are how fast the wind can get at that moment) With the wind will come the coldest air of the season! Winds chills with be below zero for many and temps Monday night will also fall below zeros in northern sections. Furthermore the northerly wind will make for a long fetch over the lakes; dumping crazy amounts of snow (see last post). Keep warm and keep it here to Midwest weather talk!